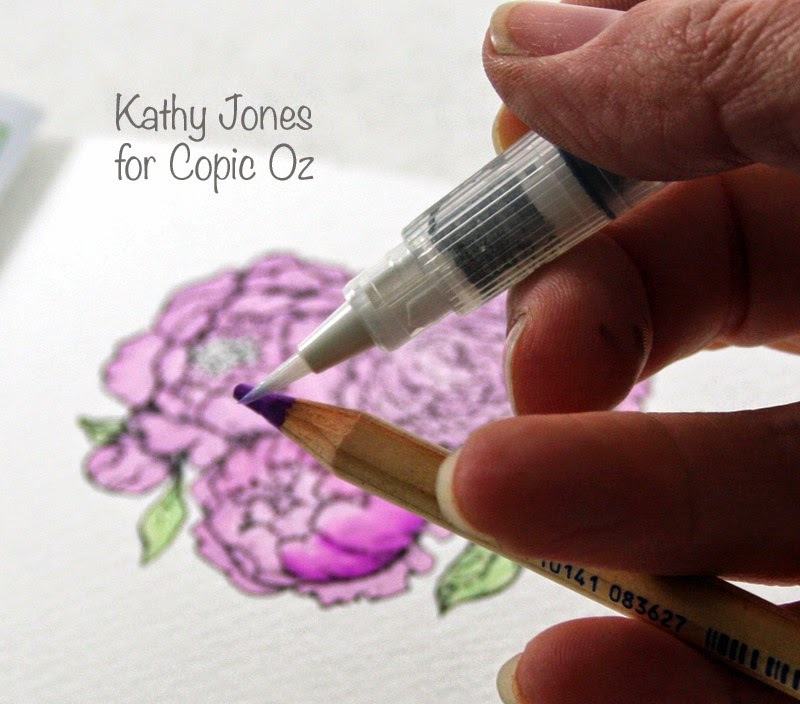 Hello Everyone and welcome to another Copic Oz tutorial. 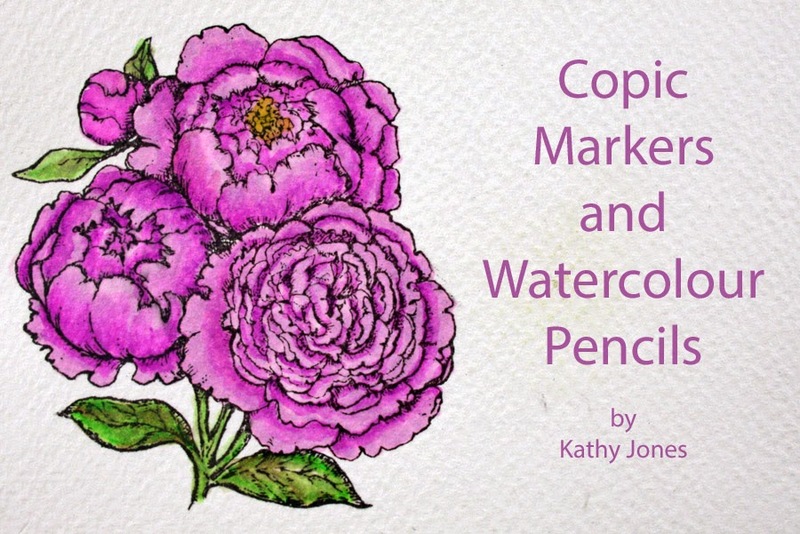 Today I'm playing with Copics and Watercolour Pencils and using them with a stamped image! 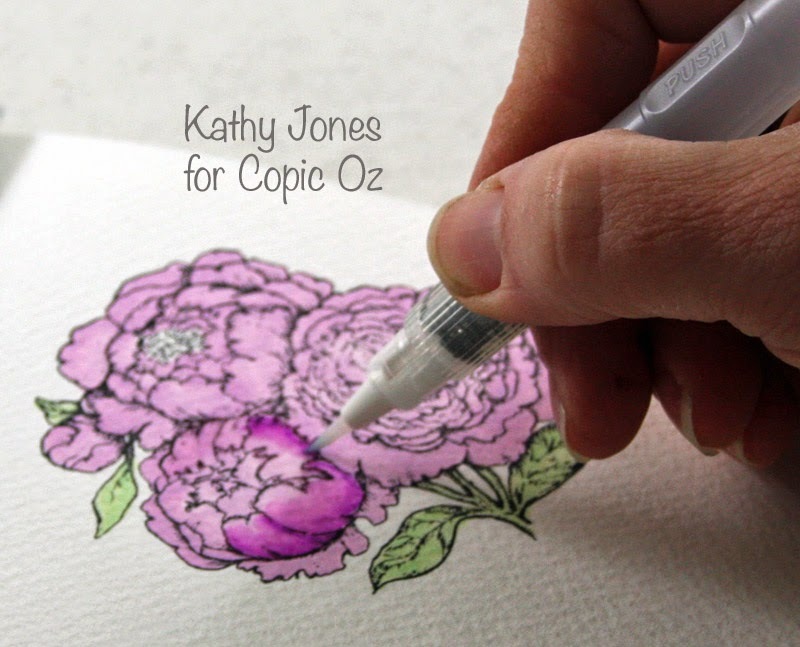 Perhaps you are a watercolourist and thinking about venturing into Copics.....or a Copic lover thinking about playing with watercolours.....this is a fabulous way to play with both and create beautiful images! 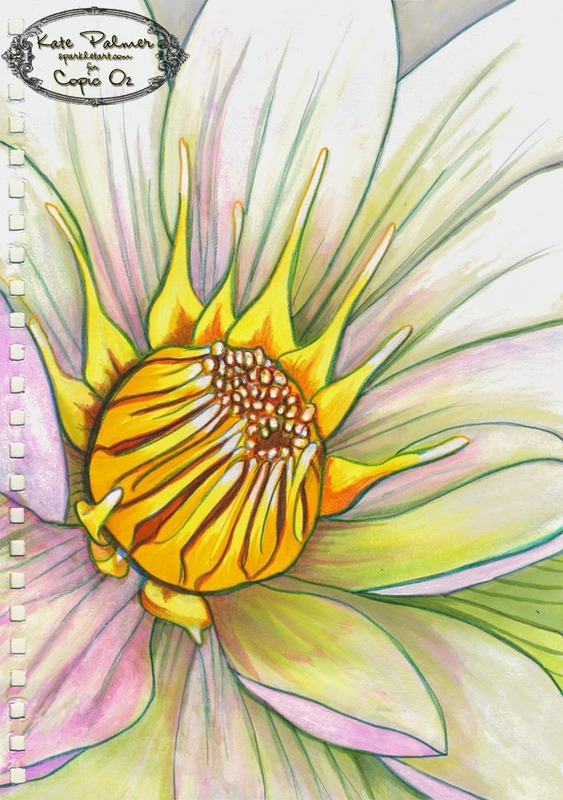 I've laid down the base colours of my image in V01 for the flowers and G40 for the leaves. 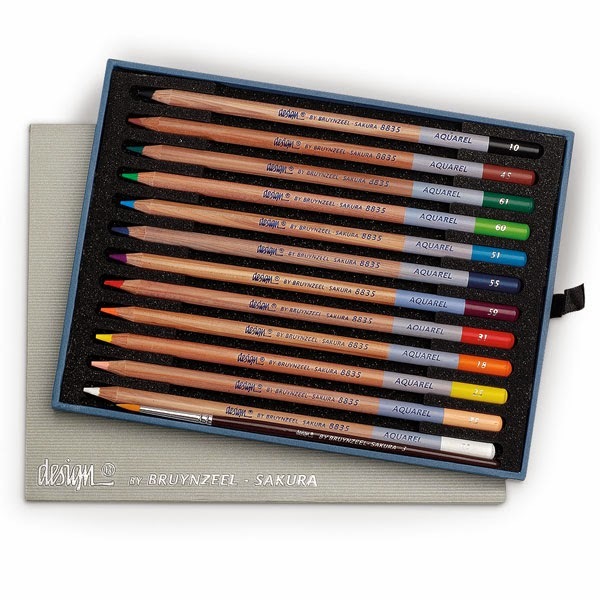 I've then reached for my Bruynzeel Aquarel Pencils. 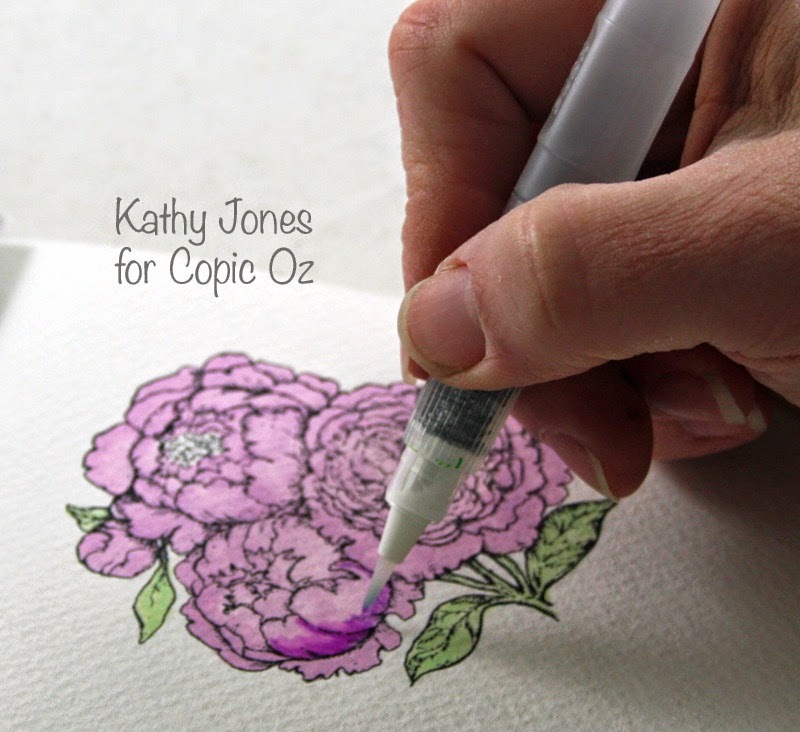 Make sure your Memento ink is well set before you start using the watercolours - I like to use a heat gun to make sure there is no unexpected bleeding! 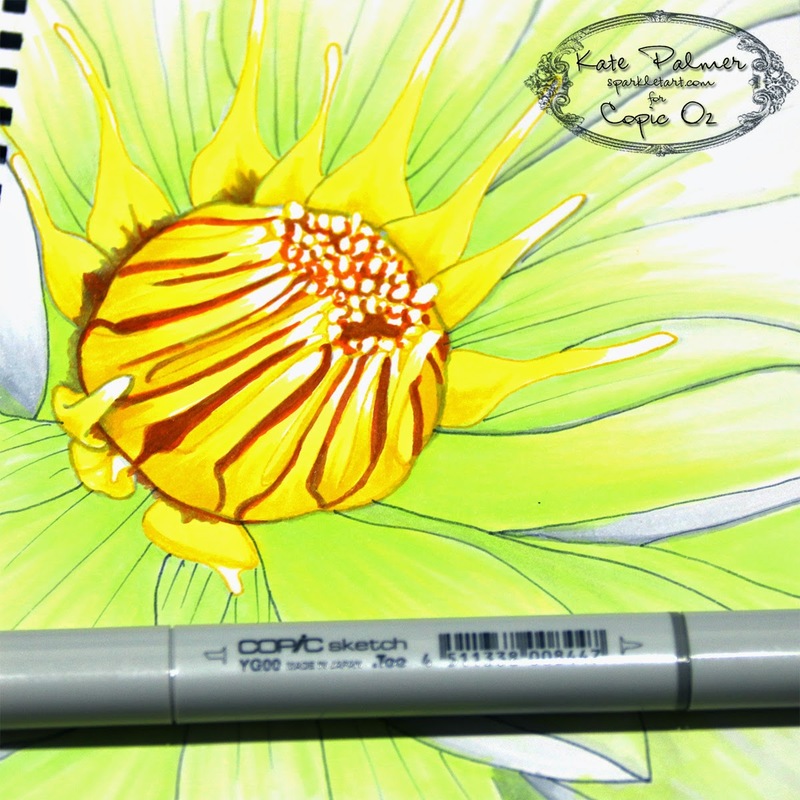 Then use an aquabrush (or regular brush and water.....I just happen to prefer an aquabrush) to use over the pencil and sweep it upwards to create your shading. 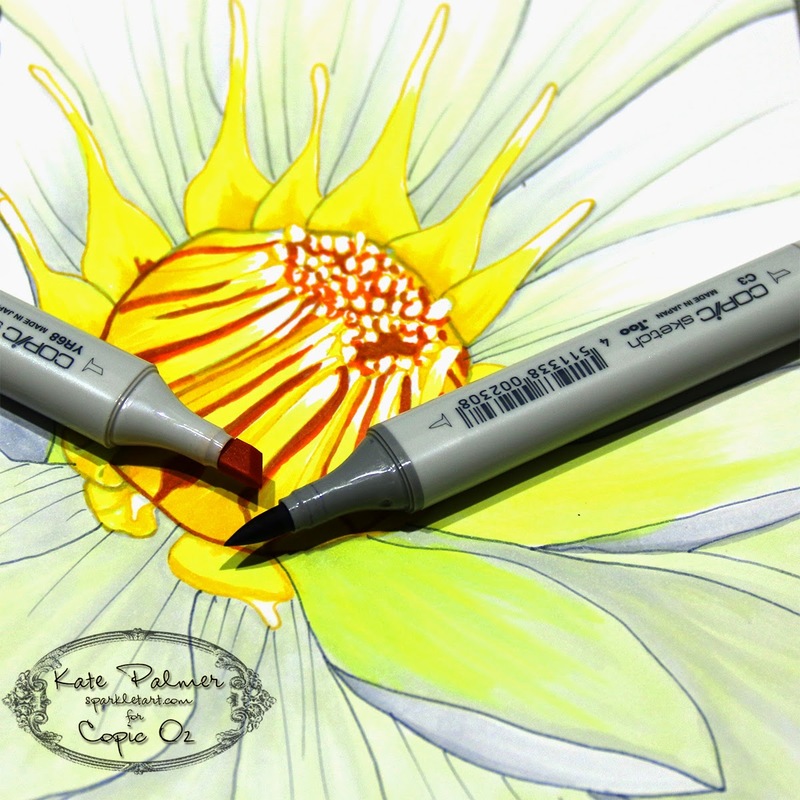 Another way of doing your colouring is to use the aquabrush on the image first (this won't react with your Copics at all as it is water and not alcohol based like your markers). 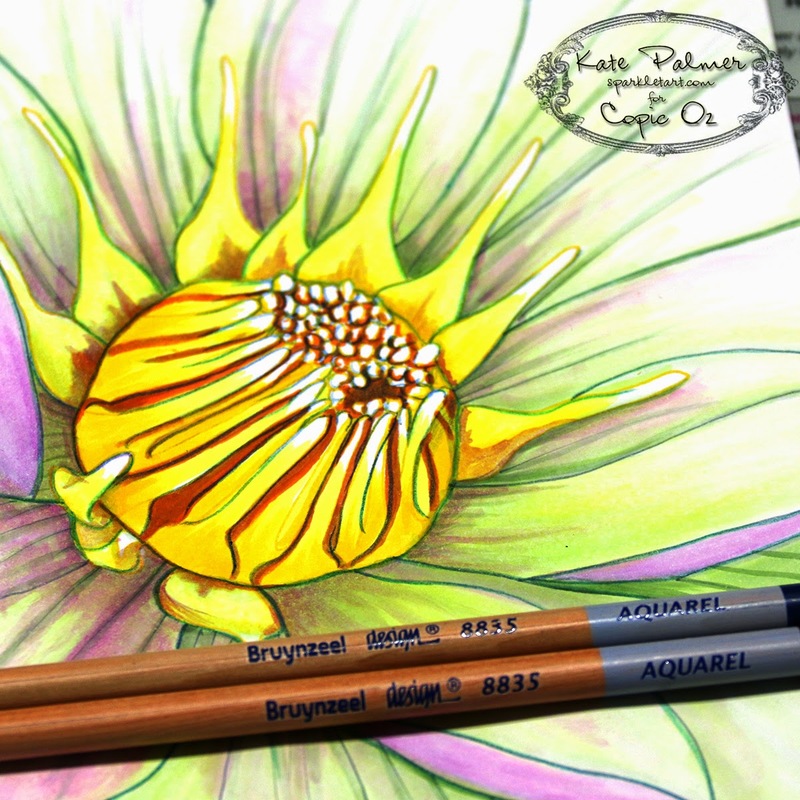 The add your pencil over the pre-wet areas. 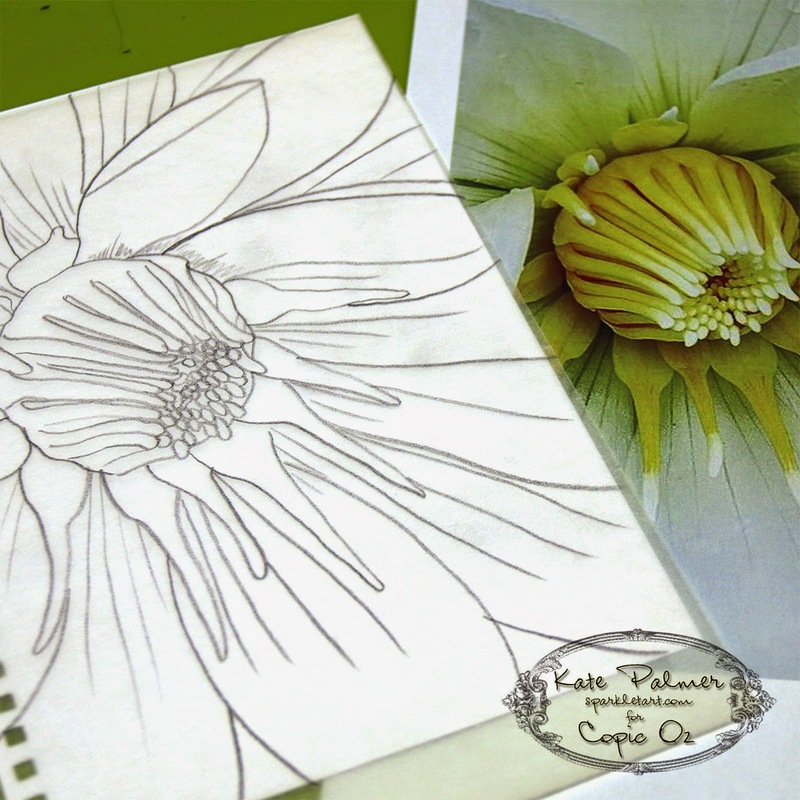 You'll feel the pencil go on smoother then if applied to dry paper. 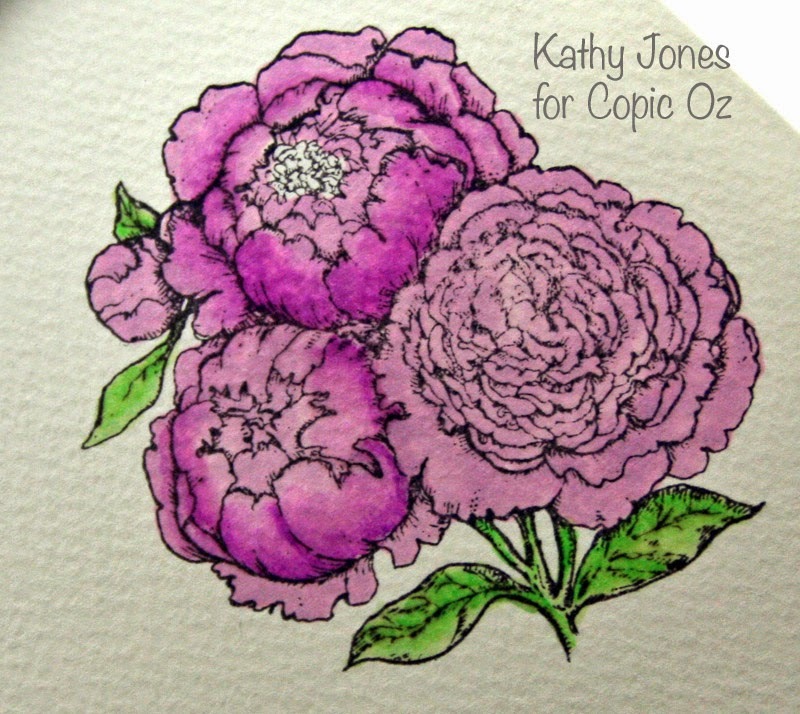 Then once again, use your aquabrush to blend the colour out for shading. 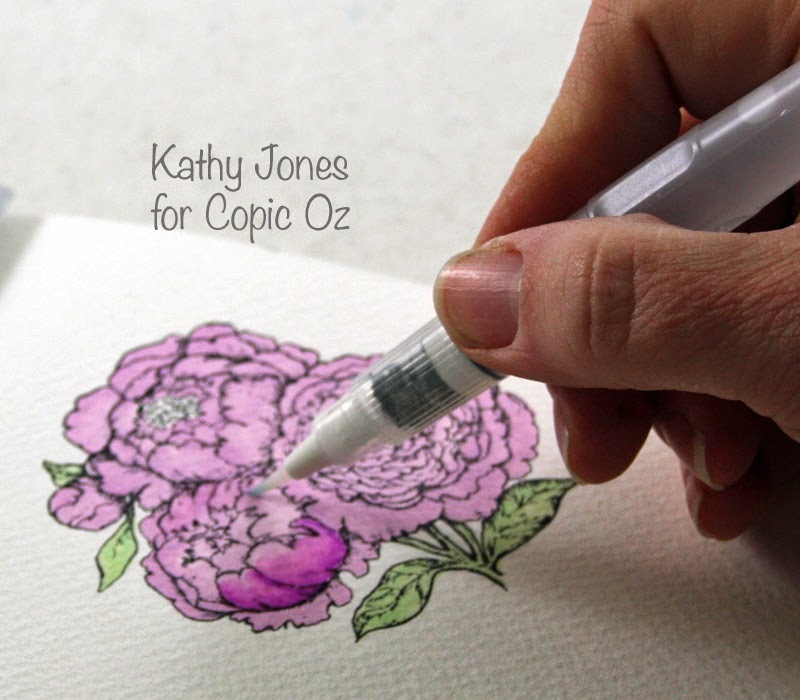 Another option is like the Copic Tip-to-Tip technique, where you touch your wet brush or aquabrush to the colour of your pencil. 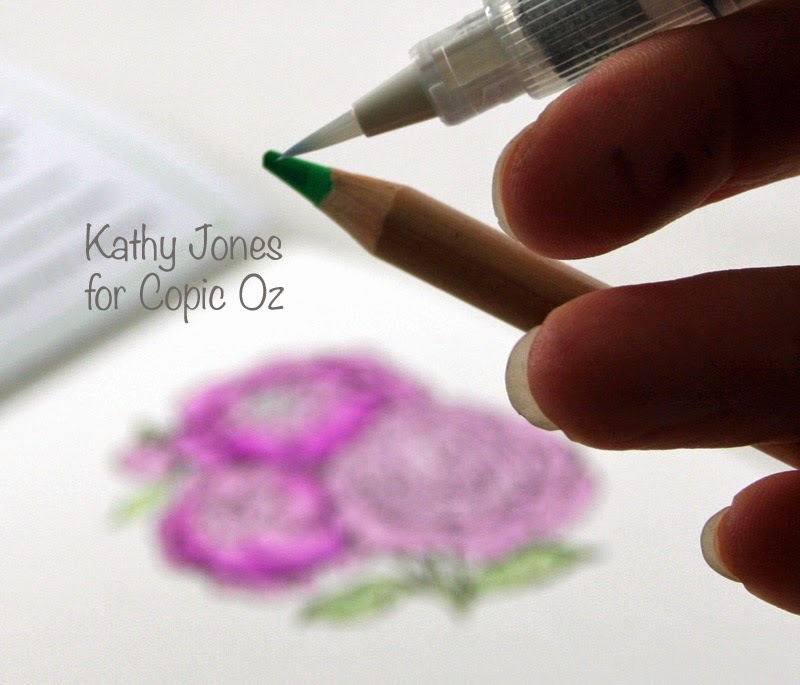 Then apply the colour from the aquabrush to your image (see the top flower) for your shading. I quite like this option as you can control how much colour you pick up off the pencil for subtle shading. 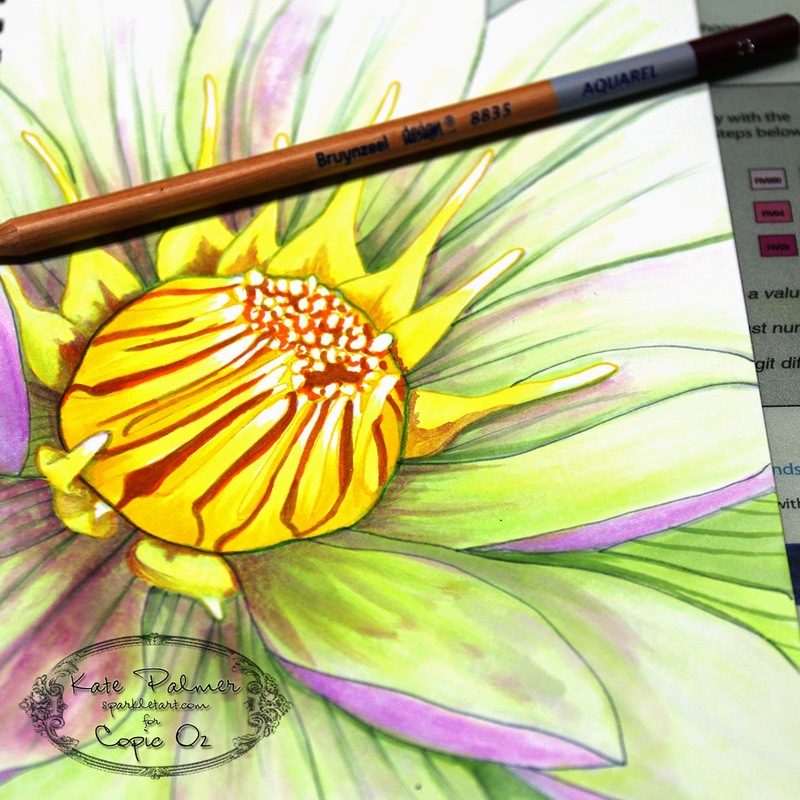 I've used this technique again with the green Bruynzeel pencil (Number 60). And apply the green to the leaves for shading. For a little more interest, I've used this same technique with the Brown Bruynzeel (Number 45). And added the brown to the leaves for a little shading. 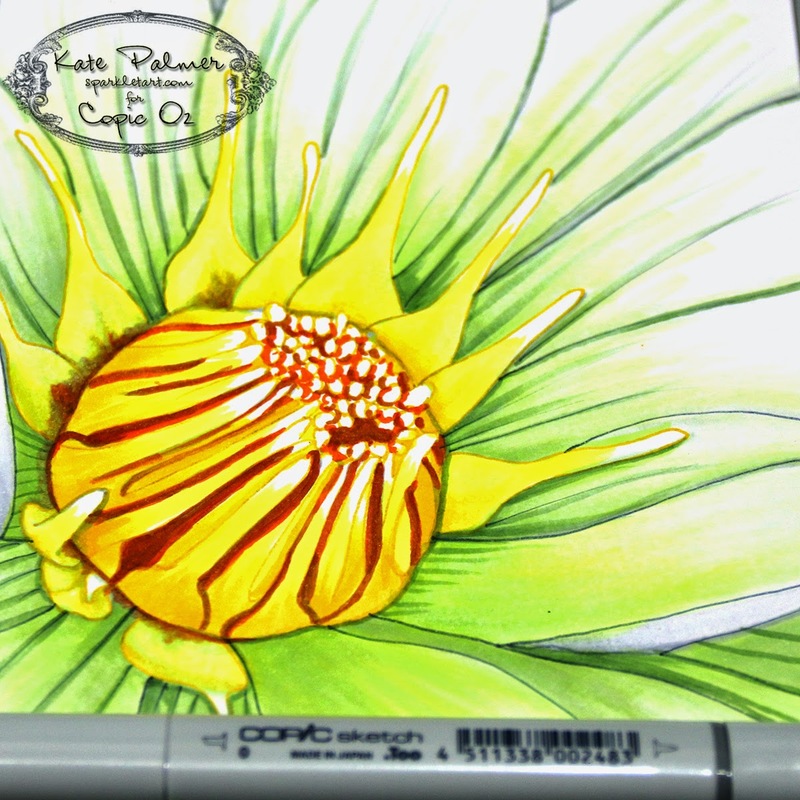 I've continued to colour the flowers and leaves using the steps above, keeping in mind that the shading will be darkest at the base of the petals. 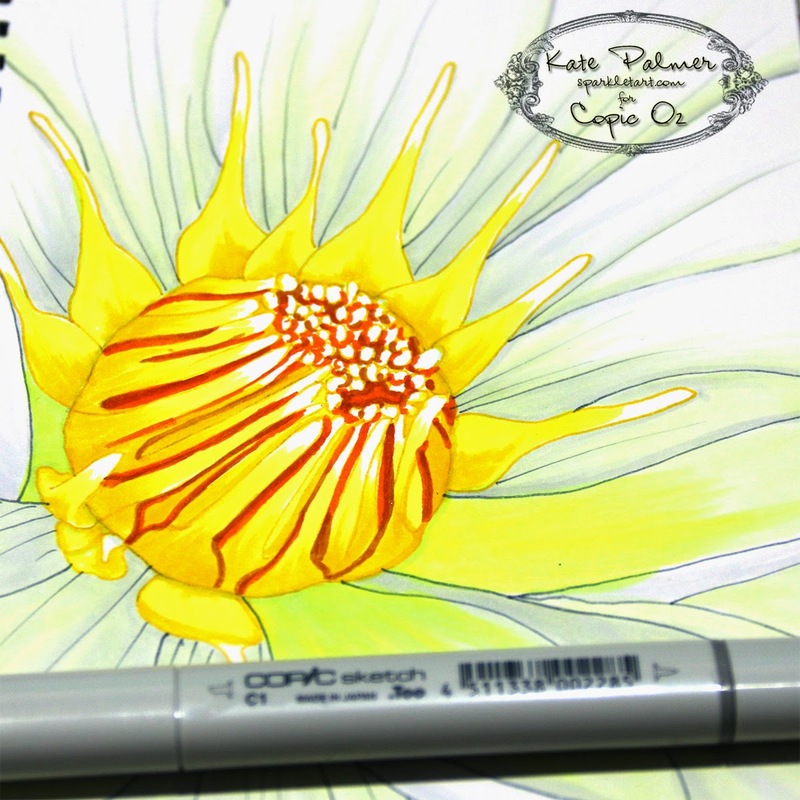 I've also used the yellow (Number 25) for the centre of the top flower. I've cut out the image with circle nestabilities and then added a light watercolour wash around the image using Blue (Number 51) and Brown (Number 45). Complete your card! 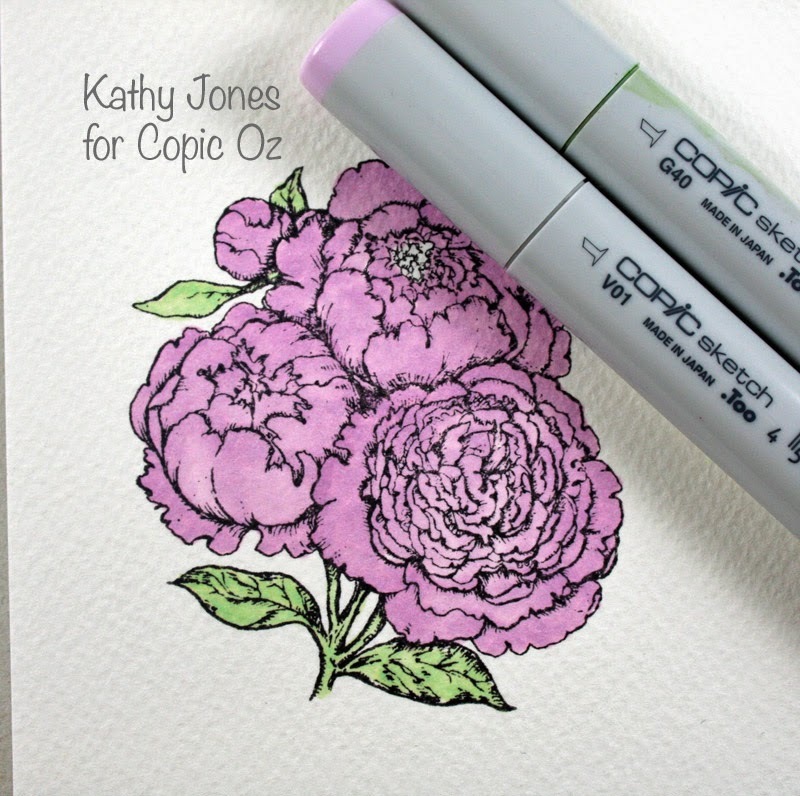 I hope you've enjoyed today's tutorial, thanks for popping by and happy colouring! 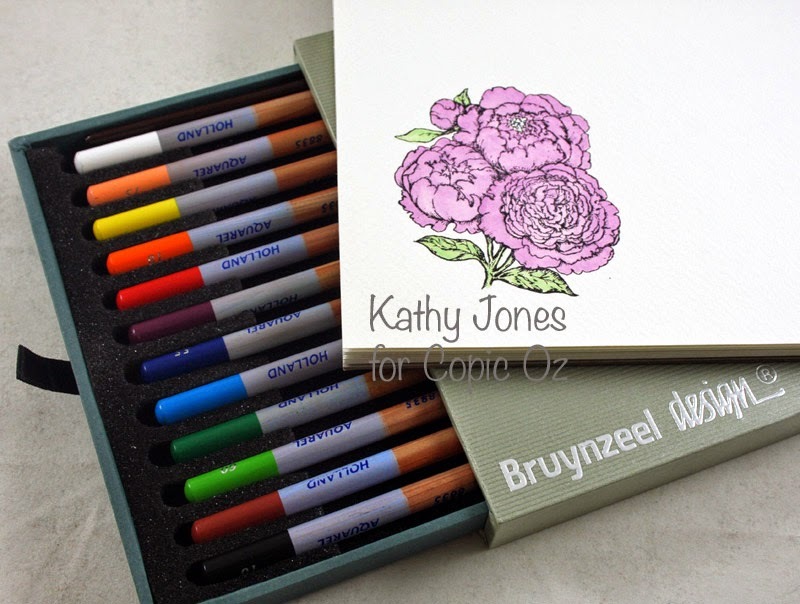 Today I'm having a play and combining my Copic Markers with some of my new Bruynzeel Design Aquarel (Watercolor) Pencils to see what happens! 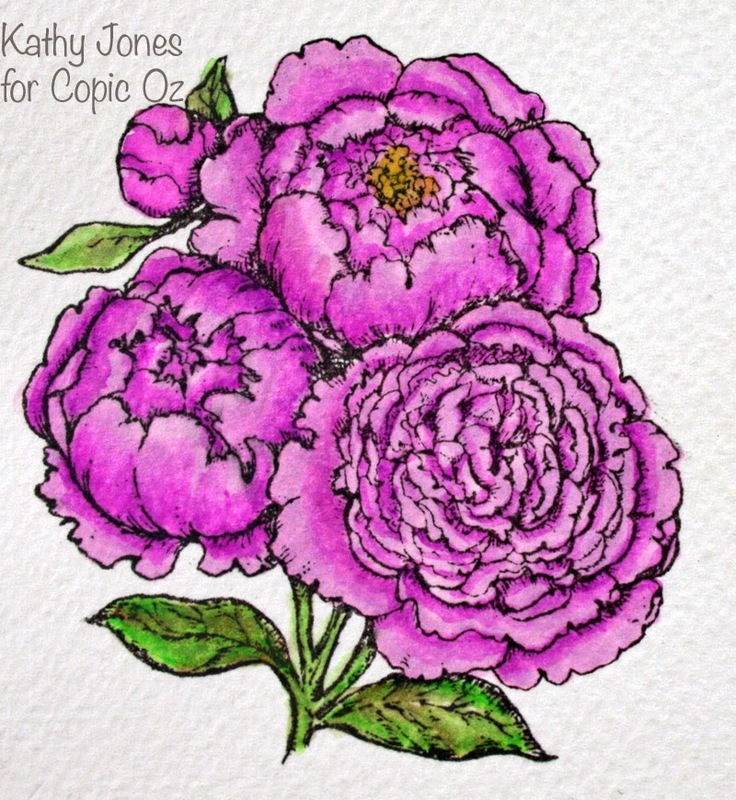 I'm hoping I can create a finished piece that is subtly coloured and allows me to use the translucency of watercolours to enhance my Copic coloured image. 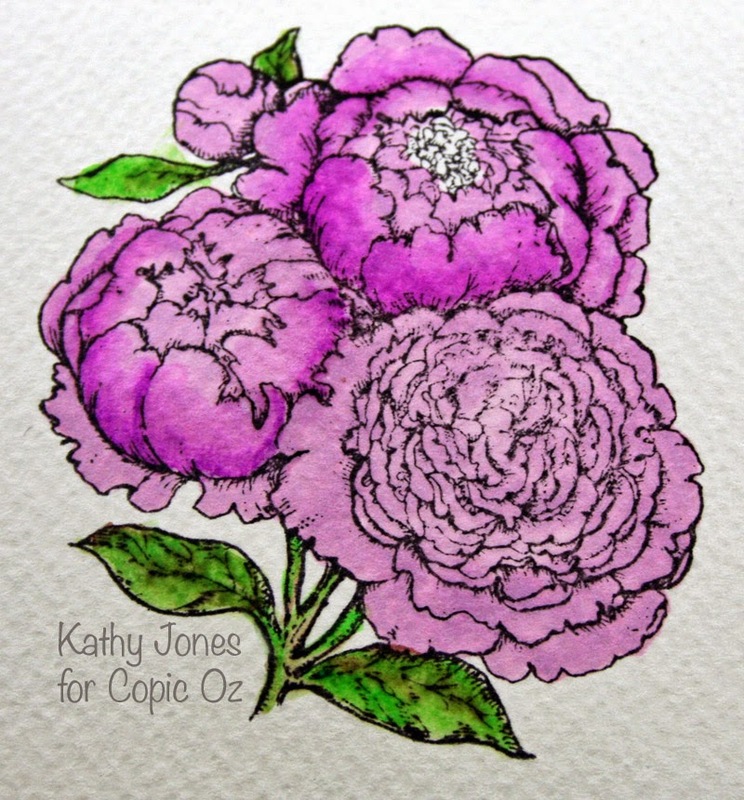 Now this project could end up as a card front, journal page or even a framed piece - the choice is yours. 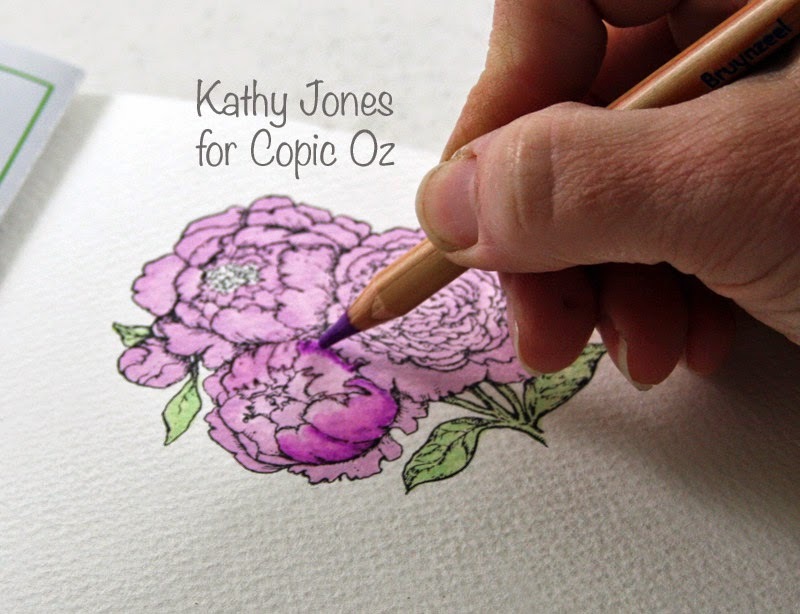 Begin by choosing an interesting flower and tracing this onto your paper, try to make your pencil lines as light as possible. 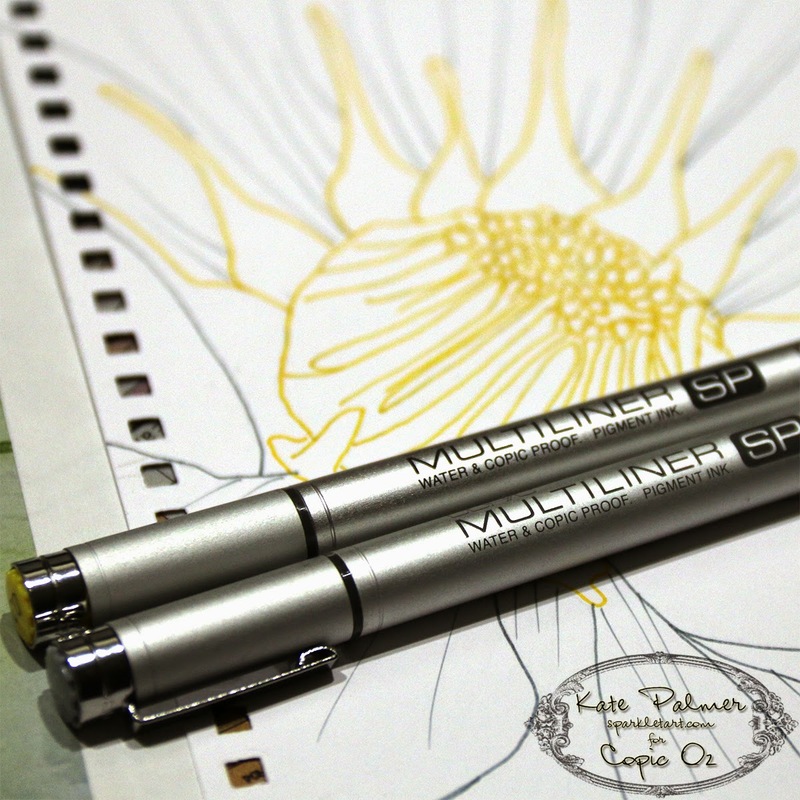 Go over image with your Multi Liners and erase the pencil marks. 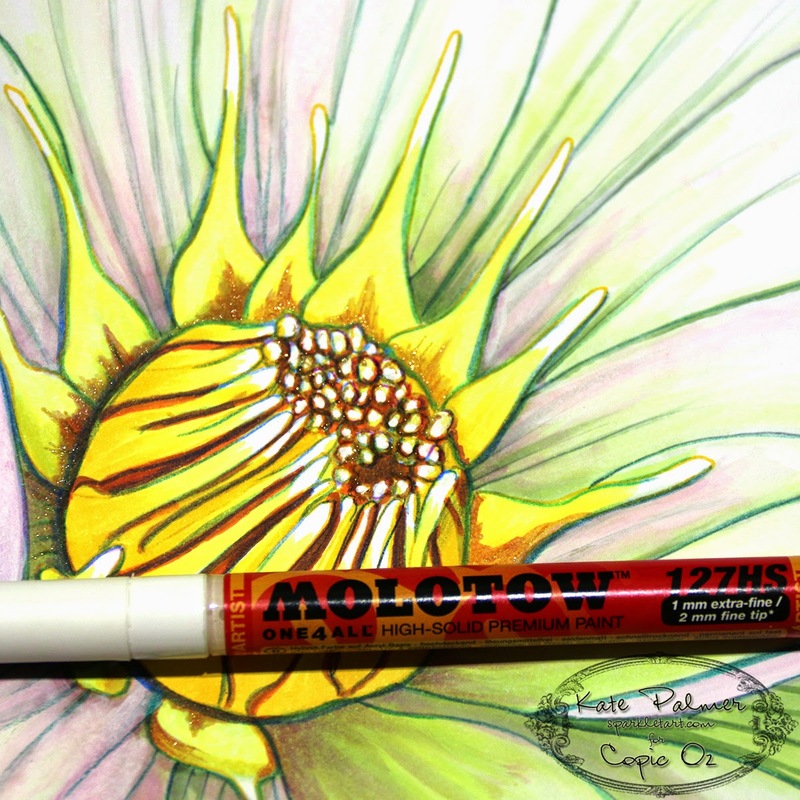 Add in the areas of darkest colour to the flower center using YR27. 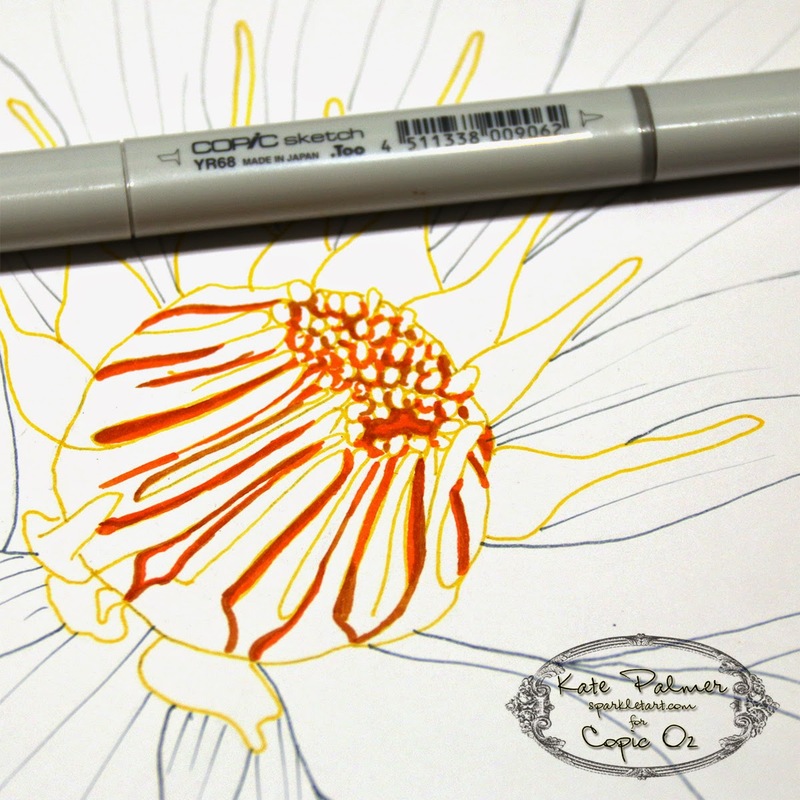 Add YR68 next to and on top of the darker orange - the center of the flower will be brightly coloured using heavy contrast of colours so that the image pops. 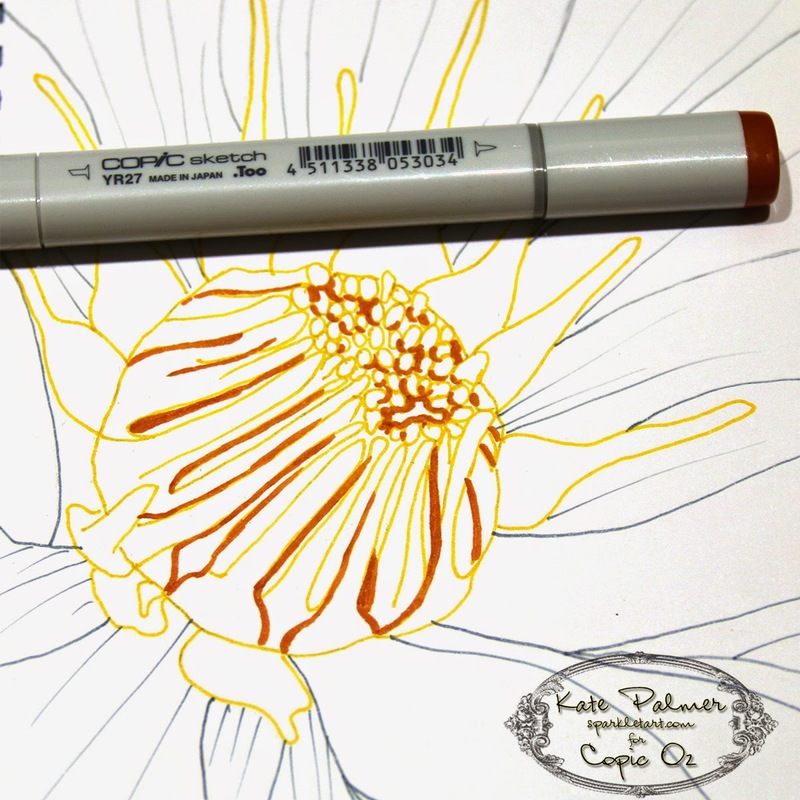 Colour all the center elements of the flower using Y06 - leave the tips white as in the original photograph. 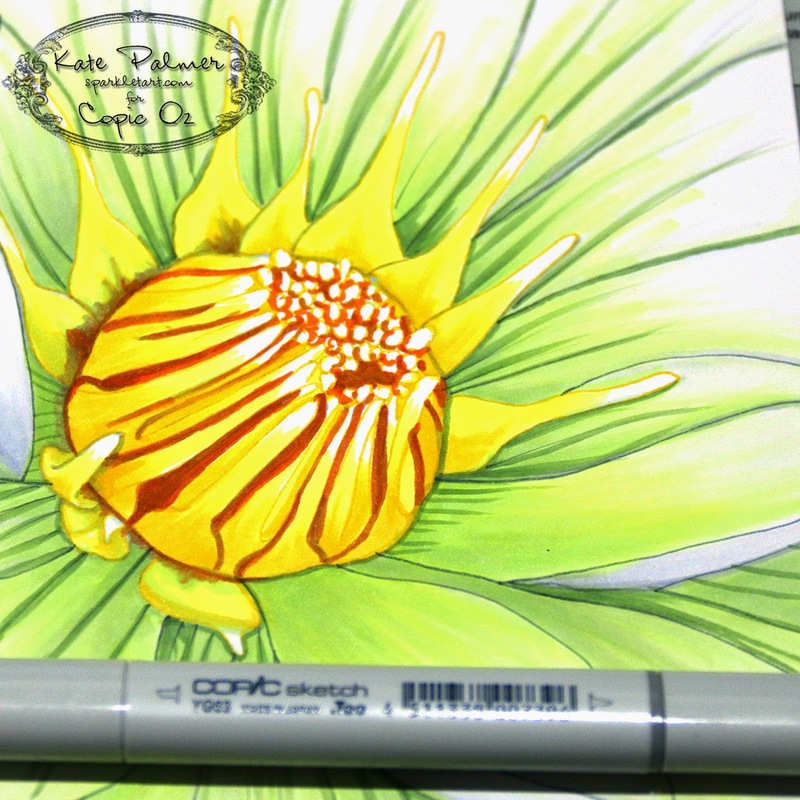 Add Y08 to the base of the central petals for some depth and shading - don't worry too much about blending for this central section as you want it to be stark and draw your eye. 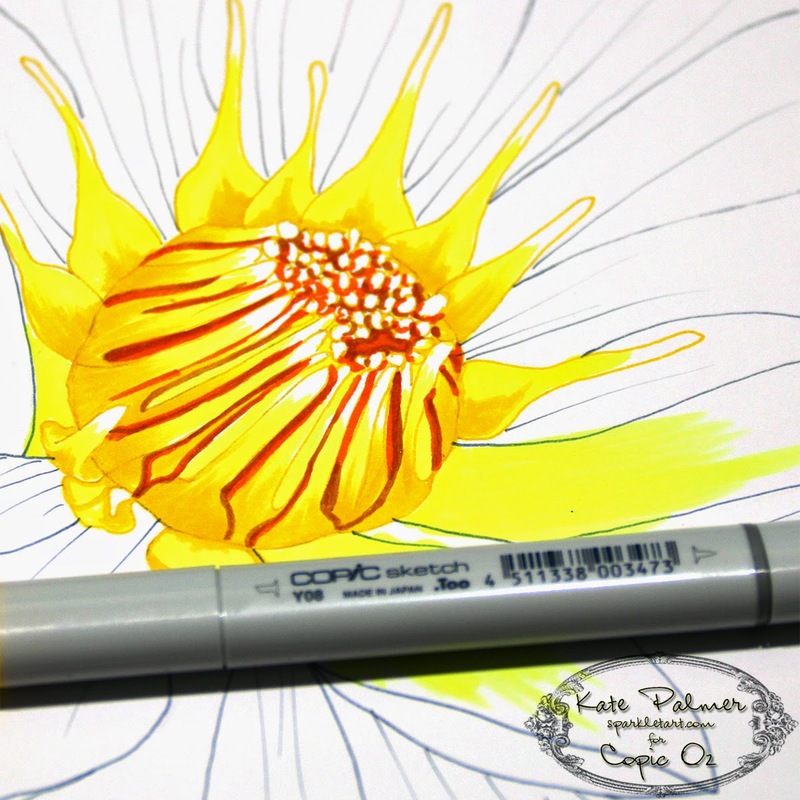 Begin adding colour to the outer petals using YG0000, start colouring from the center of the flower and sweep the colour towards the outer edge - without colouring the entire petal - the edges should remain white. Next use C1 to add a little grey shadow close to the center and on any areas of petals where there is shadow - check the original image if in doubt. Darken the shadowed areas with C3 as needed. 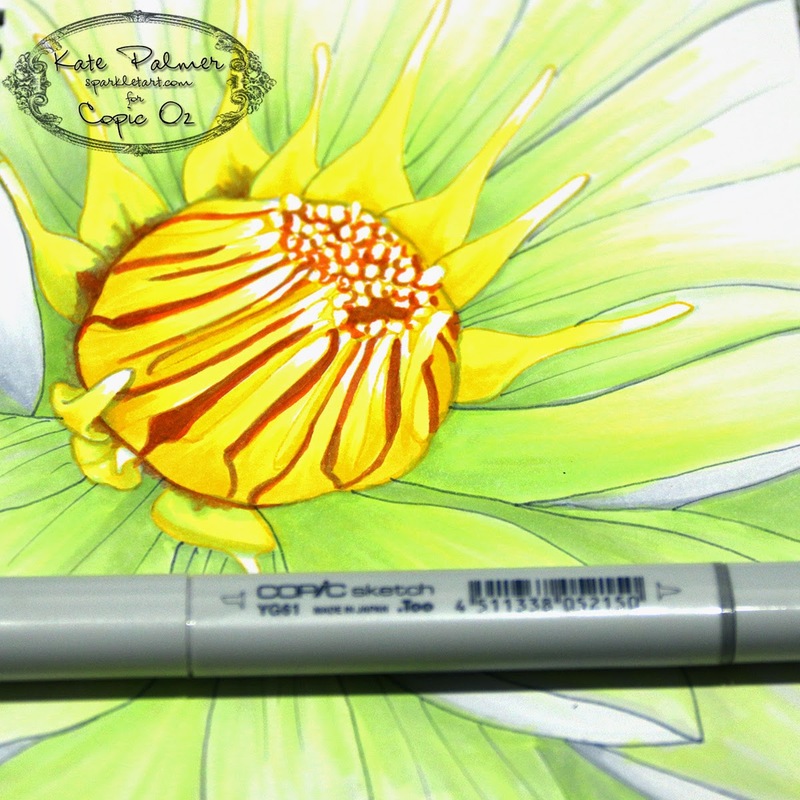 Next I've used the tip-to-tip technique to apply some darker orange (YR68) mixed with grey (C3), for some dirty shadows around the central yellow petals, as the orange by itself was far too bright. 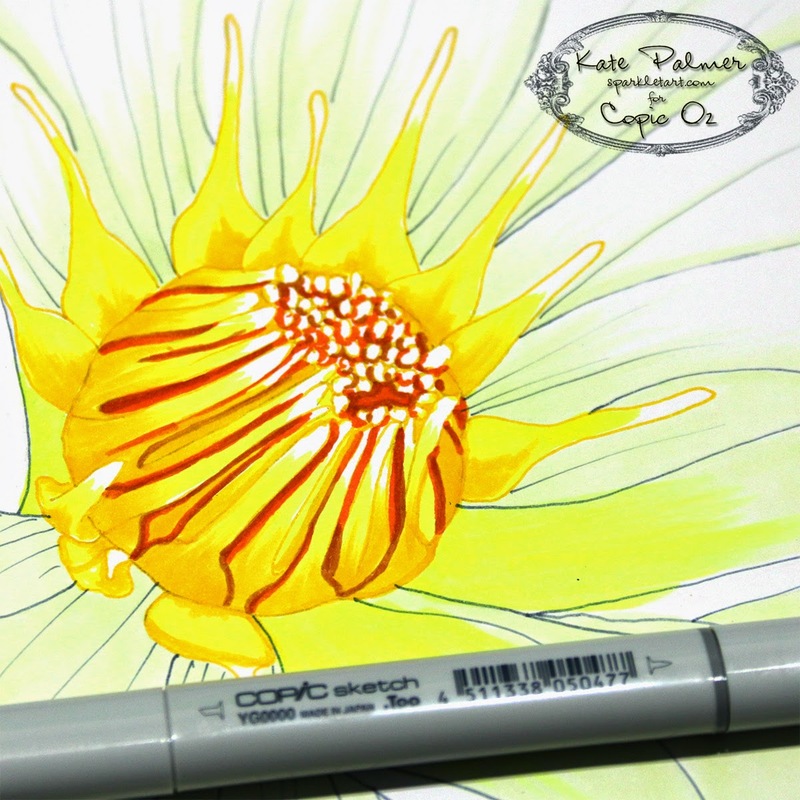 Next Add YG01 to the base of each of the outer petals (it's at this point you should begin to blend a little). 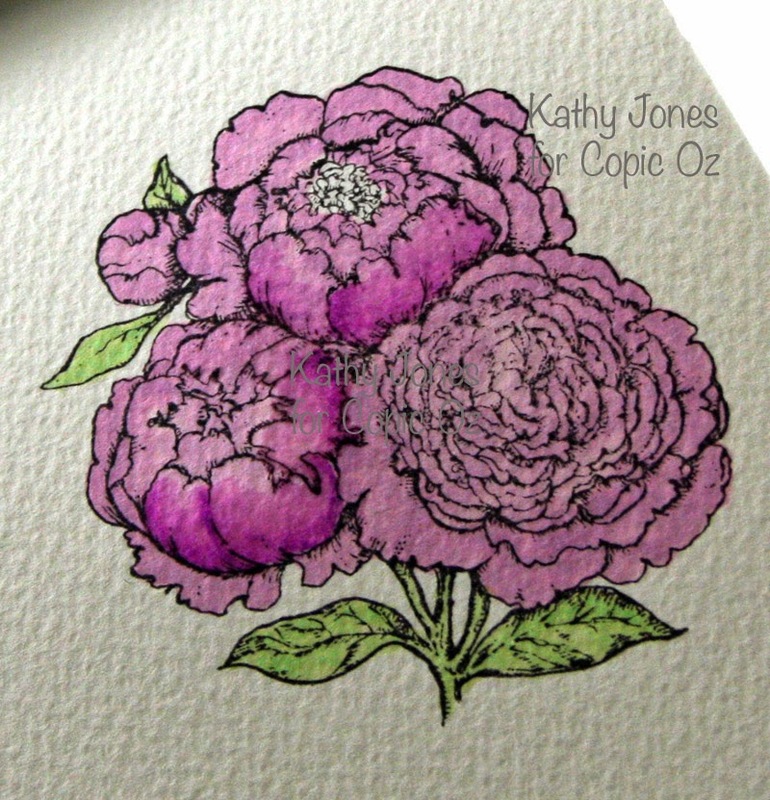 Add a little YG00 to the petals for a smoother blend. 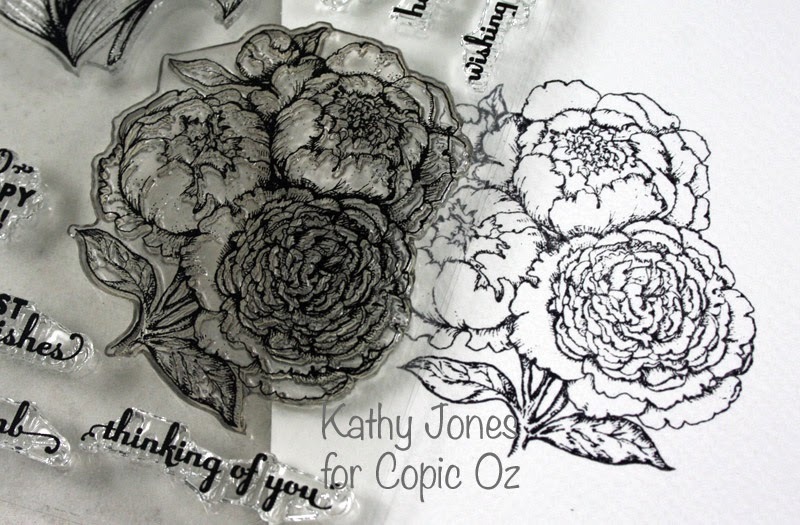 And use the YG01 to darken some of the outer petals. 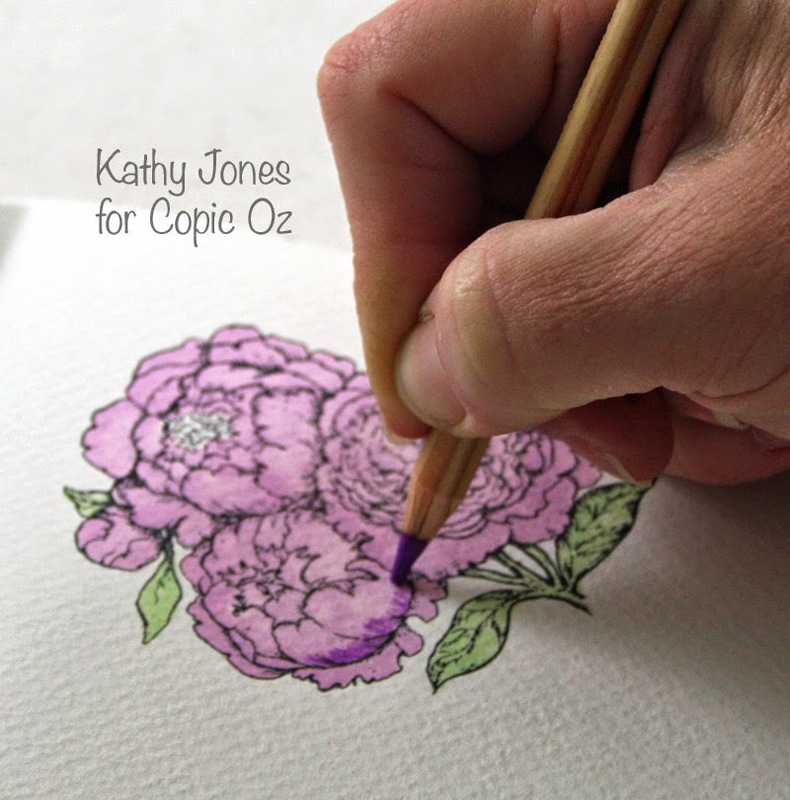 Then go over all the outside edges of petals using the Colourless Blender to fade the colour back a little. 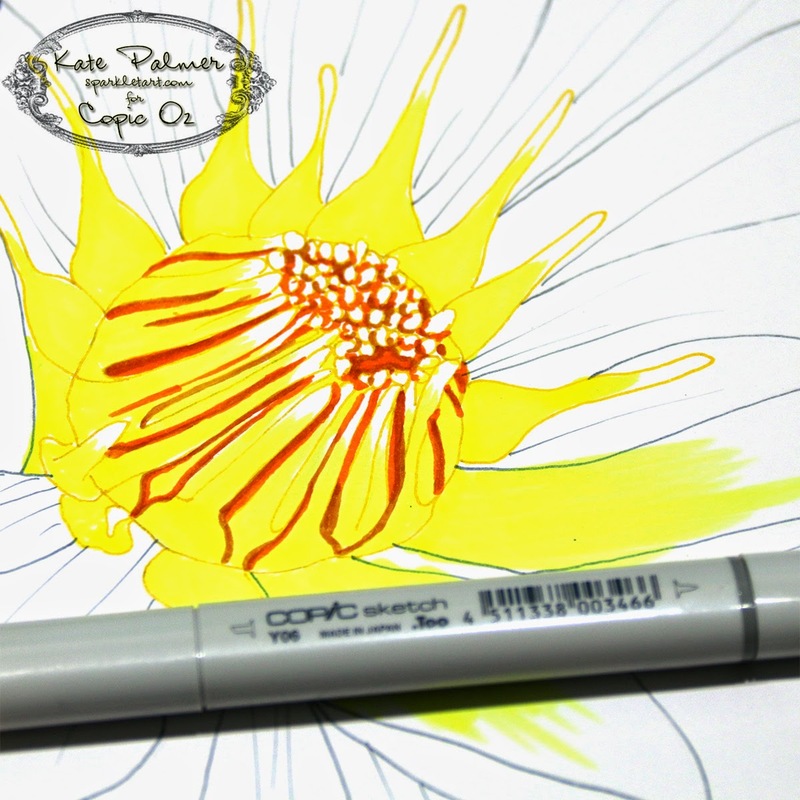 Don't colour right to the middle just the outside 1/2 of each petal where the colour fades to white. Next I'm adding a little of the purple (61) watercolor pencil as a paint, by scribbling on some scrap paper and picking up the colour with a wet brush, then painting directly over the Copics. I've done this to add a little drama into the image. 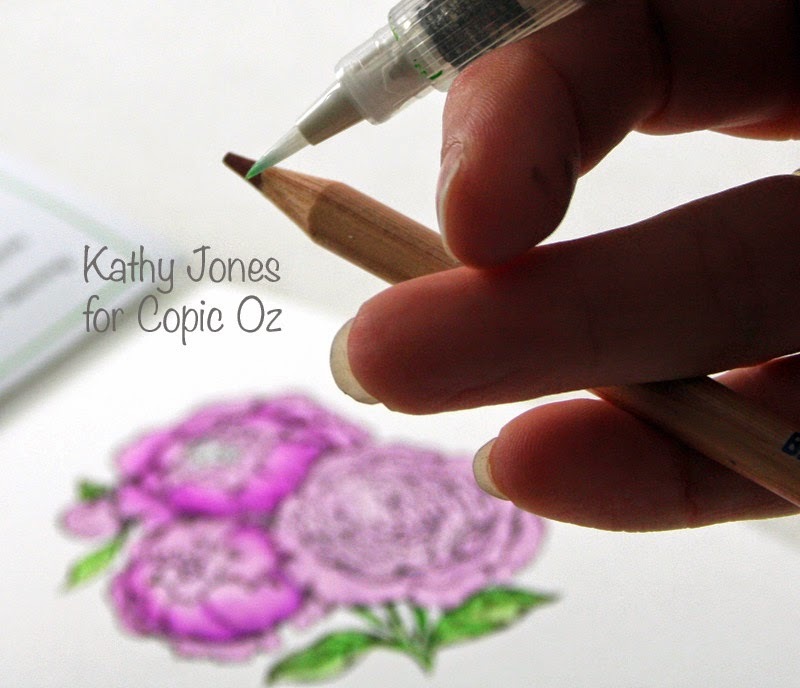 The blending card is quite thirsty, so you will end up with some darker areas if using the pencil this way. Next I've used some dark blue and green (59 & 55) to add some detail to the image - I have used these as pencils for this step and drawn directly onto my image. 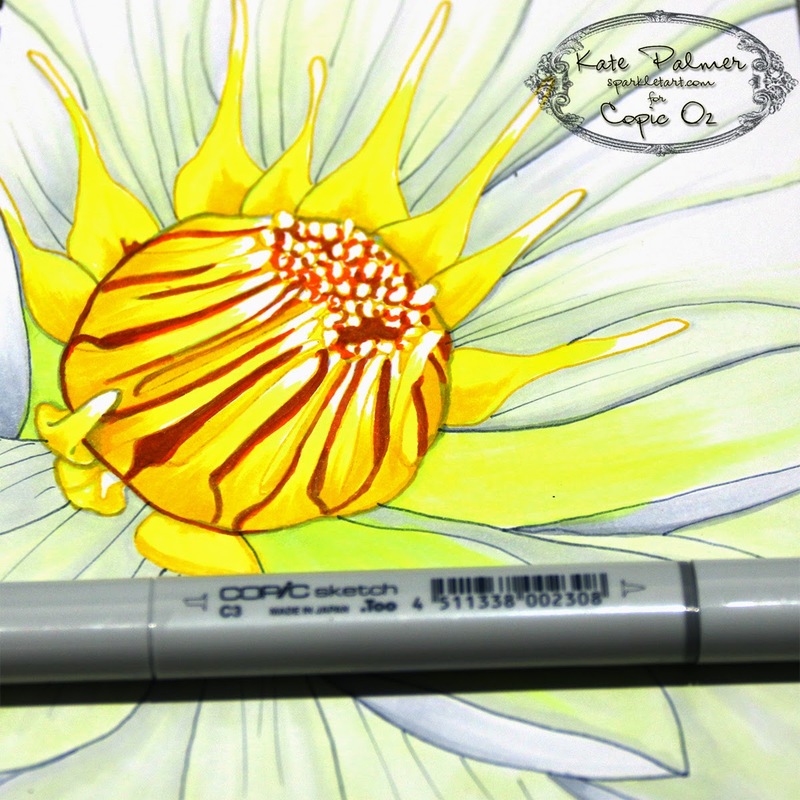 I've also added little Gold and clear Spica onto the central petals. 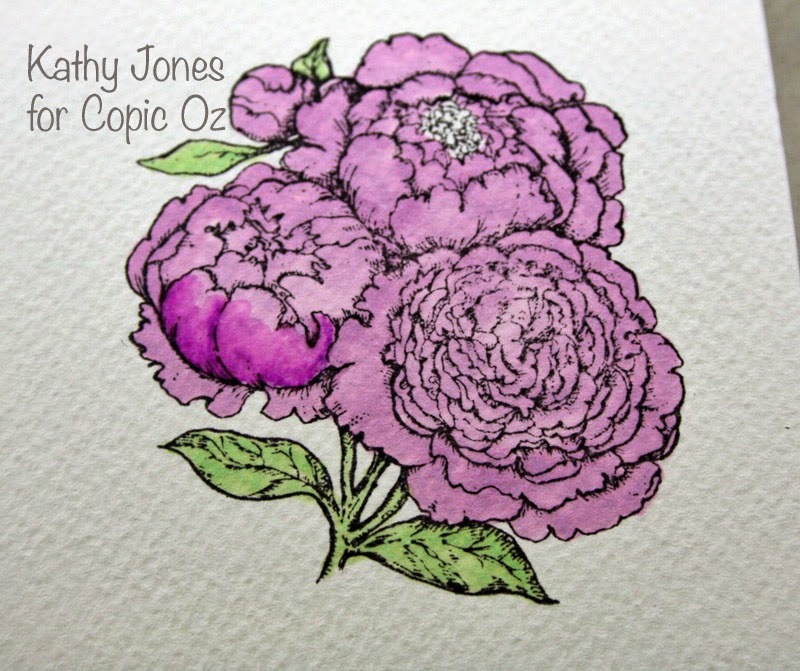 For the final step I have used some of the paint from my Molotow white marker (scribble onto some plastic and pick up the paint from there) and painted this onto my image with a wet paintbrush - this adds a transparent chalky layer onto the flower and lightens the purple and greens, letting the colour sink into the background - if you prefer the highly coloured image - skip this last step. 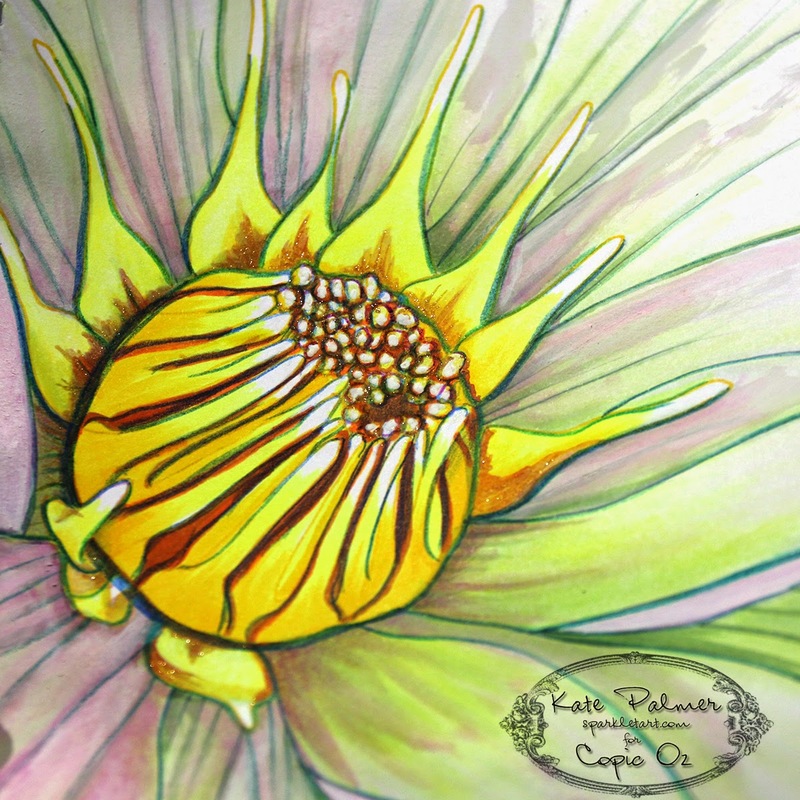 The finished flower has colours with the translucency of watercolours, the detail of a sharpened pencil and the richness of copic markers! 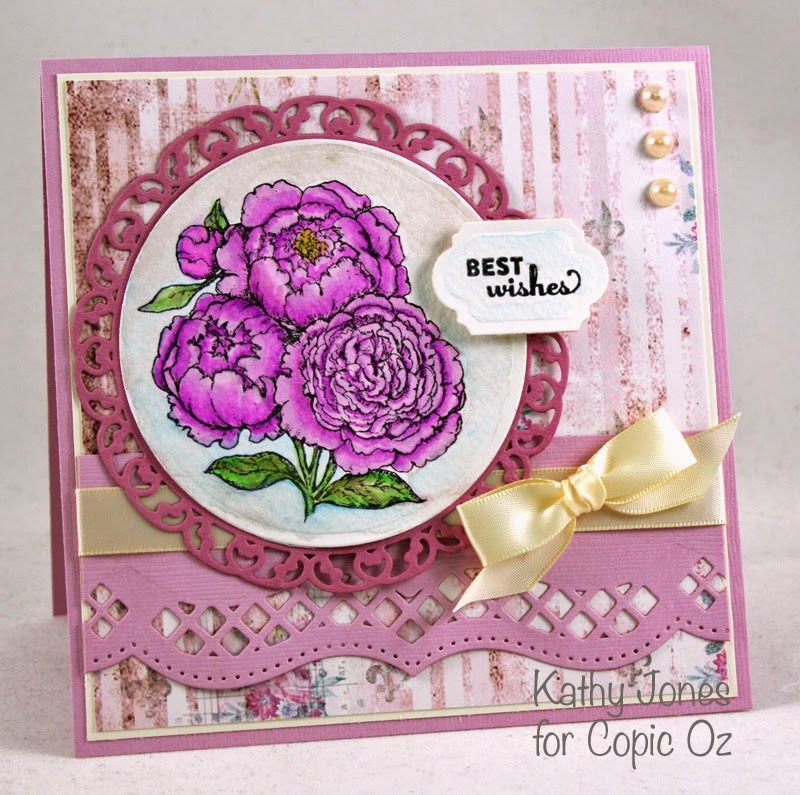 The finished result uses quite a bit or artistic license with the final colours but is super soft and pretty. 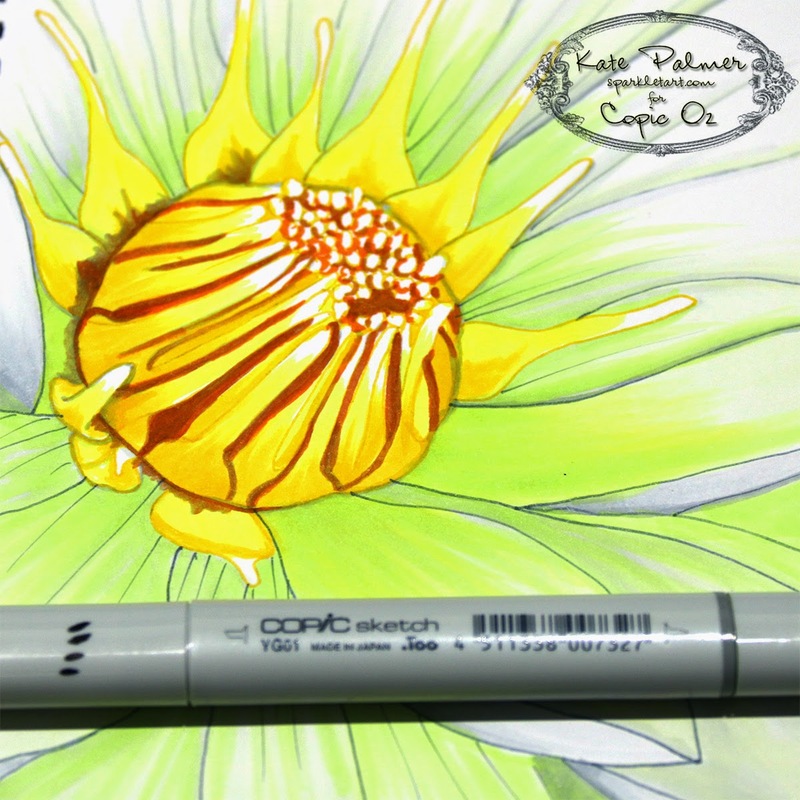 I hope this inspires you to combine some of your other art materials with your Copic markers in the future.